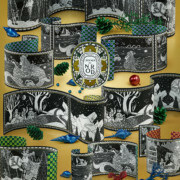 this is the plot of a fairy tale told by the designer Pierre Marie with the new scented candles by Diptyque. Legend of the North brings them together in the longest night of the year. Three travellers from the mountains of the South, the seas of the West and the forests of the East meet in the land of eternal snow to carry out a ritual. They light candles and throw marzipan, a pearl and pine needles into the flames. ‘Reveal the legend of the North!’ they chant. Suddenly, three spirits appear with a promise: they will reveal the secret of the North before dawn in the form of an object that is thousands of years old, thus fulfilling the travellers’ wishes. Shortly afterwards, a glistening gold compass appears in the candlelight. The man behind Legend of the North is the designer Pierre Marie. 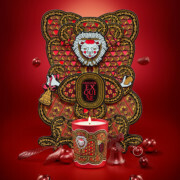 He has illustrated a limited-edition winter collection for Parisian perfume house Diptyque for the third time, even providing the accompanying fairy tale. 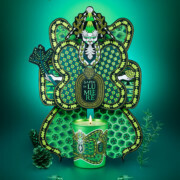 After all, he often takes his creative inspiration from folklore and animated films. 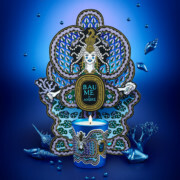 The spirits – who take the form of a bear, a siren and a stag – each stand for one of the three scented candles: Sapin de Lumière, Amande Exquise and Baume d’Ambre. It is now time for the legend to be retold, perhaps as the gentle aromas of pine and cedar wood waft through the room.